Visit Ford for more information on the Ford Flex. 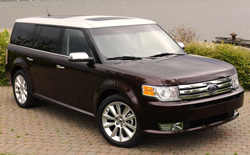 New to the Ford family in 2009 is the Ford Flex - a crossover with a very prominent, bold stance. There are three models to choose from the Flex SE, SEL or the Limited. Several packages are available to further customize the Ford Flex such as the Lighting Package which features ambient lighting, LED tail lights and HID head lights. The interior of the Flex is beautiful and very contemporary in style and seats up to seven comfortably. Cloth seats are standard on the SE while the SEL and Limited models get upgraded leather trimmed bucket seats. While the SE gets single zone climate control - the SEL and Limited get dual-zone electronic automatic temperature climate control. A rear Seat DVD entertainment is available on the Limited and SEL models while a voice activated navigation system with reverse camera system and SIRIUS TravelLink is available only on the Limited model. For an extra look of class an available woodgrain appearance appliqué for the doors and instrument panel comes standard on the SEL and Limited models. Another cool feature available for the SEL and Limited versions of the Ford Flex is an optional rear console refrigerator which can chill seven cans to 41° F and also has a freeze mode that will chill down to 23° F.
Ambient lighting in seven colors is standard on the limited and available on the SEL. While a body colored liftgate is standard on the SEL and SE models a sharp Satin-aluminum appliqué is standard on the Limited power liftgate. A multipanel Vista Roof that consists of four skylights that cover all three rows of seating is available on Limited or SEL models. Standard on all models is Easy Fuel a capless refueling system. Under the hood of the 2009 Ford Flex is a capable 262 horsepower 3.5 liter V6 engine combined with a 6-speed automatic transmission that achieve a fuel economy of 17 mpg in the city and 24 mpg on the highway. If safety is a top priority then the 2009 Ford Flex should certainly satisfy - the list of standard safety features is immense. Some of the features are Ford's Personal Safety System® including dual stage front air bags, crash severity sensor and driver seat position sensor and Safety Canopy side curtain air bags for all three rows.